Exclusive: The mainstream media’s big takeaway from Richard Nixon’s Watergate resignation is that “the cover-up is always worse than the crime.” But that’s because few understand the crime behind Watergate, Nixon’s frantic search for a file on his 1968 subversion of Vietnam peace talks, reports Robert Parry. To fully understand the Watergate scandal, which led to President Richard Nixon’s resignation 40 years ago, you have to know the back story starting in 1968 when candidate Nixon took part in a secret maneuver to scuttle the Vietnam peace talks and salvage a narrow victory over Vice President Hubert Humphrey. In essence, what Nixon and his campaign team did was to contact South Vietnamese leaders behind President Lyndon Johnson’s back and promise them a better deal if they stayed away from Johnson’s Paris peace talks, which President Nguyen van Thieu agreed to do. So, with Johnson’s peace talks stymied and with Nixon suggesting that he had a secret plan to end the war, Nixon edged out Humphrey. After his election, Nixon learned from FBI Director J. Edgar Hoover that President Johnson had amassed a detailed file on what Johnson called Nixon’s “treason,” but Nixon couldn’t locate the file once he took office and ordered an intensive search for the material that explained why the Paris peace talks had failed. But the material stayed missing. Nixon’s worries grew more acute in mid-June 1971 when the New York Times and other major U.S. newspapers began publishing the Pentagon Papers leaked by former Defense Department official Daniel Ellsberg. Though the Pentagon Papers covering the years 1945 through 1967 exposed mostly Democratic deceptions, Nixon knew something that few others did, that there was a potential sequel that could be even more explosive than the original. By mid-1971, an increasingly angry and radical anti-war movement was challenging Nixon’s continuation of the conflict. In early May, a series of demonstrations had sought to shut down Washington. Some 12,000 protesters were arrested, many confined at RFK Stadium in a scene suggesting national disorder. In June, the Pentagon Papers further fueled the anti-war fury by revealing many of the lies that had led the nation into the bloody Vietnam quagmire. So, Nixon recognized the political danger if someone revealed how Nixon’s pre-election maneuvers in 1968 had prevented President Johnson from bringing the war to an end. Nixon became desperate to get his hands on the missing report (or file) about the failed peace talks. In a series of tape-recorded meetings beginning on June 17, 1971, Nixon ordered a break-in (or even a fire-bombing) at the Brookings Institution where some Nixon insiders believed the missing material might be hidden in the safe. There was even talk about fire-bombing the centrist Washington think tank, but the break-in never apparently happened, although Brookings’ historians say there was an attempted break-in during that time frame. The historians also say that Brookings never possessed the missing file or report. Nevertheless, Nixon and his advisers had crossed an important Rubicon, creating a team of burglars who would become known as the Plumbers. This team, under Hunt’s command, would break into the office of Ellsberg’s psychiatrist seeking information to discredit the whistleblower and into the Democratic National Committee at the Watergate building on May 28, 1972, to plant bugs and rifle through files. On June 17, 1972, when the team returned to the Watergate to plant more bugs, five of the burglars were arrested by Washington police. Though Nixon and his team were able to keep a lid on the scandal until the November election, which he won handily over Sen. George McGovern, the cover-up eventually proved to be Nixon’s undoing. As investigators closed in on Nixon’s use of hush money and other obstructions, some insiders, such as White House counsel John Dean, began to talk. When Congress learned that Nixon had taped many of his Oval Office conversations, the President faced demands for these recordings, which Nixon fought furiously to protect. Eventually, however, the U.S. Supreme Court ordered the tapes be turned over and Nixon’s political fate was sealed. On Aug. 8, 1974, he announced to the nation that he would resign and, on Aug. 9, he signed the official papers and departed from the White House aboard a Marine helicopter. But the mistaken lesson that the U.S. mainstream media derived from the scandal was that “the cover-up is always worse than the crime,” a silly saying that reflected the media’s ignorance about what the underlying crime was. In this case, the historical record now shows that Nixon set the Watergate scandal in motion in 1971 out of fear that perhaps his greatest crime would be exposed how he sabotaged Vietnam peace talks to gain a political edge in an election. Of the 58,000, U.S. soldiers who died in Vietnam more than 20,000 died during Nixon’s presidency. Possibly a million more Vietnamese died in the Nixon years. But, in the end, Nixon accepted a peace deal in late 1972 similar to what Johnson was negotiating in 1968. And the final outcome was not changed. After U.S. troops departed, the South Vietnamese government soon fell to the North and the Vietcong. Several years ago, I located the missing file at the LBJ Library in Austin, Texas. Before leaving office in January 1969, Johnson had ordered his national security adviser Walt Rostow to take the top secret material out of the White House with instructions to hold it until after Johnson died and then decide what to do with it. 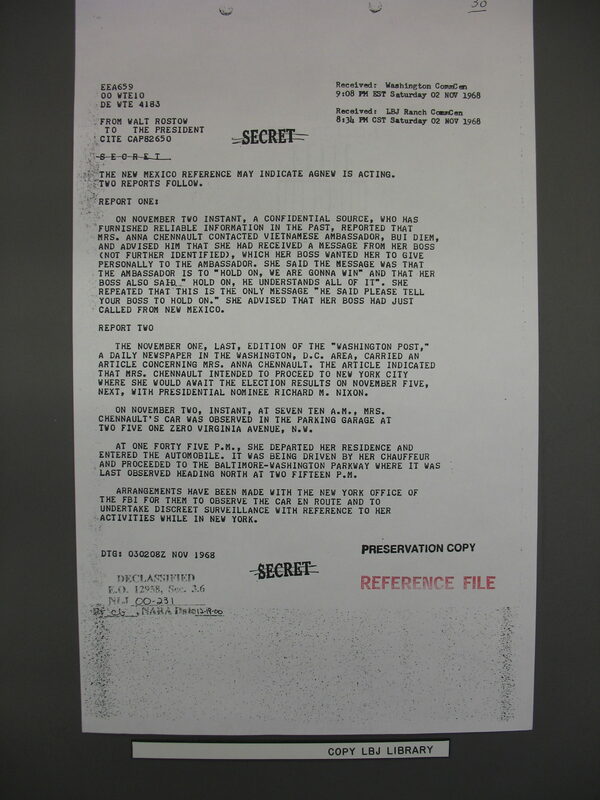 Rostow labeled the file “The X-Envelope” and retained possession until after Johnson’s death on Jan. 22, 1973, just two days after Nixon began his second term. Eventually, Rostow decided to turn over the file to the LBJ Library with instructions to keep it sealed for at least 50 years. However, library officials decided to open “The X-Envelope” in 1994 and began the process of declassification. The documents many based on FBI wiretaps show that Johnson had strong evidence about Nixon’s peace-talk sabotage, particularly the activities of campaign official Anna Chennault who passed messages to South Vietnamese Ambassador Bui Diem in Washington urging the South Vietnamese leaders to maintain their boycott of the Paris peace talks. That same day, Thieu recanted on his tentative agreement to meet with the Viet Cong in Paris, pushing the incipient peace talks toward failure. Several years ago, the National Archives released tape recordings of Johnson’s phone calls further clarifying the depth of Johnson’s knowledge and anger. On the night of Nov. 2, Johnson telephoned Senate Republican Leader Everett Dirksen of Illinois and urged him to intercede with Nixon. Though Johnson personally spoke with Nixon about the Chennault issue, Nixon simply denied doing anything wrong and the peace stalemate continued through the final days of the campaign. On the day before the election, Johnson had one last chance to expose Nixon’s “treason” when the White House was asked by the Christian Science Monitor to respond to a Saigon-datelined article drafted by correspondent Beverly Deepe who had discovered the Republican obstruction from her South Vietnamese sources. Johnson consulted with Rostow, Secretary of State Dean Rusk and Defense Secretary Clark Clifford in a Nov. 4 conference call. Those three pillars of the Washington Establishment were unanimous in advising Johnson against going public, mostly out of fear that the scandalous information might reflect badly on the U.S. government. Johnson concurred with their judgment. An administration spokesman refused to confirm or deny the story, leading the Christian Science Monitor’s editors to spike Deepe’s scoop. Nixon’s interference with the Paris peace talks remained secret as Americans went to the polls, many believing that Nixon did have a plan to end the war. Instead, once in the White House, Nixon escalated the war with heavier bombing of North Vietnam and an invasion of Cambodia. U.S. combat involvement would continue for four more years. Four decades ago, Richard Nixon resigned, making him the first U.S. president in history to quit the office, the result of two years of a spreading scandal known as Watergate. But many Watergate reforms aimed at limiting the power of money over politics were short-lived, as Michael Winship observes. In August 1974, forty years ago this week, commentator Alistair Cooke faced a dilemma. The events of the Watergate scandal “a Laurel and Hardy absurdity in the beginning,” Cooke recalled had snowballed since 1972 from a farce of botched burglary into a severe constitutional crisis, and events were building to a big finish. A few days before, the House Judiciary Committee had voted for three articles of impeachment against Richard Nixon. It seemed clear that the full House would support the committee and impeach the president, and that the Senate would convict. What was Nixon going to do defy Congress? Resign? “He’ll brazen it out,” the historian Samuel Eliot Morison told Cooke. There even were rumors of a coup d’état. Washington hadn’t been so enflamed and jittery since the Civil War, when Confederate troops were camped just across the Potomac or when the British put the city to the actual torch during the War of 1812. In those early August days, events would reach a crescendo but none of us knew the final outcome, and that was Alistair Cooke’s problem. Each week, the learned, avuncular author and BBC correspondent (best-known to U.S. public TV watchers as the host of “Masterpiece Theatre”) recorded a “Letter from America” for BBC radio worldwide. But to have it ready for the weekend, he always recorded it on Wednesday so this time, his deadline meant he would have to deliver his letter before anyone knew for sure what Nixon’s fate would be. It was the perfect solution. Masterly, fans wrote Cooke. So dramatic, so tasteful, they said, wonderful restraint. None of them knew that chronological necessity had been the mother of rhetorical invention, that the commentator had plucked a plum from the prickles of chaos and uncertainty. There was a lot of scrambling that week. I was working in Washington at my first television job, in the employ of NPACT, the National Public Affairs Center for Television. We supplied public television with its Washington coverage: everything from monthly documentaries and live coverage of congressional hearings, to three weekly series, including Washington Week in Review. The previous year, NPACT had produced gavel-to-gavel coverage of the Senate Watergate Committee hearings, the first pairing of Robert MacNeil and Jim Lehrer. The primetime repeats of those hearings helped establish PBS as a player and raised millions in pledge money a wonderful irony in the face of Nixon’s attempts to bludgeon public television to death. Nominally, I was in charge of publicity and advertising, but we were small in number and in a crisis, doubled and tripled at different jobs. That summer, we had co-produced with the BBC and CBC a dramatic recreation of President Andrew Johnson’s impeachment trial in 1868 (I remember reading All the President’s Men, hot off the press, on the flights to and from Raleigh, North Carolina, where we videotaped). We had just finished our daily coverage of the House Judiciary Committee hearings and I had been the editorial assistant, pulling wire copy, making phone calls, helping however possible. Tuesday and Wednesday, emergency meetings with Republican leadership were held at the White House, with even the most diehard supporters on the judiciary committee finally telling Nixon he had to go. Whatever was going to happen, NPACT made contingency plans for a four-and-a-half hour special that would take up the entire PBS evening schedule. Thursday, Aug. 8, we knew Nixon would speak to the nation that night. I went to Lafayette Park to tape promos with our White House correspondent. Crowds already were beginning to gather. At 9 p.m., we were in the studio, listening to Nixon’s resignation address. I got home but it seemed anticlimactic, so I called a girlfriend who had a car and convinced her to drive with me back to Lafayette Park where the celebration was in full swing. For weeks, demonstrators had stood along Pennsylvania Avenue with signs: “Honk if you think he’s guilty.” Motorists had responded enthusiastically, and now the sound of their horns and accompanying cheers was like Times Square on New Year’s Eve at midnight. Friday morning, Aug. 9, I got to the office just as Richard Nixon was making his second speech, the slightly bizarre and emotional East Room address to his cabinet and staff in which he invoked his father’s lemon ranch, his mother’s saintliness, passing the bar exam and White House décor. Then he and his family boarded the helicopter to Andrews Air Force Base and minutes after, Gerald Ford was sworn in as the new president. That night, our mega-special aired, titled “America in Transition.” It wasn’t a summing up of Nixon and the two previous years; instead, it tried to look at what was ahead. I was in charge of two segments dealing with overseas press reaction and foreign policy. It was the first show on which I’d ever worked that had an open bar in the green room. Loquaciousness and hilarity ensued. I remember the late, great Pete Lisagor, Washington bureau chief of the Chicago Daily News, announcing on the air that Ronald Reagan didn’t dye his hair, it was prematurely orange. For a brief time, better things seemed possible and some actually happened: the bridling of an imperial presidency, the movement for campaign finance reform, a raising of ethical standards, greater oversight of the FBI and CIA because, as historian Garry Wills told Newsweek in 1982, ten years after the Watergate burglary, “We had turned to spying on ourselves; Presidents were setting up teams to topple foreign governments.” Goodness, who could imagine such things today? The changes didn’t last. The rest you know. A bitter irony of the Nagasaki atomic bomb was that an all-Christian American crew used the steeple of Japan’s most prominent Christian church as the target for an act of unspeakable barbarism, making a mockery of Christian teachings on non-violence, writes Gary G. Kohls. Sixty-nine years ago, an all-Christian bomber crew dropped “Fat Man,” a plutonium bomb, on Nagasaki, Japan, instantly annihilating tens of thousands of innocent civilians, a disproportionate number of them Japanese Christians, and wounding uncountable numbers of others. For targeting purposes, the bombing crew used St. Mary’s Urakami Cathedral, the largest Christian church in East Asia. At 11:02 a.m., on Aug. 9, 1945, when the bomb was dropped over the cathedral, Nagasaki was the most Christian city in Japan. At the time, the United States was arguably the most Christian nation in the world (that is, if you can label as Christian a nation whose churches overwhelmingly have failed to sincerely teach or adhere to the peaceful ethics of Jesus as taught in the Sermon on the Mount). The baptized and confirmed Christian airmen, following their wartime orders to the letter, did their job efficiently, and they accomplished the mission with military pride, albeit with a number of near-fatal glitches. Most Americans in 1945 would have done exactly the same if they had been in the shoes of the Bock’s Car crew, and there would have been very little mental anguish later if they had also been treated as heroes. Nevertheless, the use of that monstrous weapon of mass destruction to destroy a mainly civilian city like Nagasaki was an international war crime and a crime against humanity as defined later by the Nuremberg Tribunal. Of course, there was no way that the crew members could have known that at the time. Some of the crew did admit that they had had some doubts about what they had participated in when the bomb actually detonated. Of course, none of them actually saw the horrific suffering of the victims up close and personal. “Orders are orders” and, in wartime, disobedience can be, and has been, legally punishable by summary execution of the soldier who might have had a conscience strong enough to convince him that killing another human, especially an unarmed one, was morally wrong. When Nagasaki was destroyed, it had been only three days since another U.S. atomic bomb, nicknamed “Little Boy,” had decimated Hiroshima. The Nagasaki bombing on Aug. 9 occurred amid chaos and confusion in Tokyo, where the fascist military government, which had known for months that it had lost the war, was searching for a way to honorably surrender. The only obstacle to surrender had been the Allied insistence on unconditional surrender, which meant that the Emperor Hirohito, whom the Japanese regarded as a deity, would be removed from his figurehead position in Japan and possible subjected to war crimes trials. That was a deal-breaker, an intolerable demand for the Japanese that prolonged the war and prevented Japan from giving up months earlier. The Russian army had declared war against Japan on Aug. 8, hoping to regain territories lost to Japan in the humiliating (for Russia) Russo-Japanese war 40 years earlier, and Stalin’s army was advancing across Manchuria. Russia’s entry into the war represented a powerful incentive for Japan to end the war quickly since they much preferred surrendering to the U.S. than to Russia. And, of course, the U.S. did not want to divide any of the spoils of war with Russia. By showing off the new nuclear weapons, Washington also sent an early Cold War message to Russia that the U.S. was the new planetary superpower. Aiming at Aug. 1, 1945 as the earliest deployment date for the first bomb, the Target Committee in Washington, D.C. developed a list of relatively un-damaged Japanese cities that were to be excluded from the conventional U.S. aerial fire-bombing campaigns (that, during the first half of 1945, burned to the ground more than 60 mostly defenseless Japanese cities). The list of protected cities included Hiroshima, Niigata, Kokura, Kyoto and Nagasaki. Those five relatively undamaged cities were to be off-limits to the terror bombings. They were to be preserved as potential targets for the new “gimmick” weapon that had been researched and developed all across America during the two years of the Manhattan Project. Ironically, prior to Aug. 6 and 9, the residents of those cities considered themselves lucky for not having been bombed as much as other cities. Little did they know why they were being spared from the carnage. The first and only field test of an atomic bomb had been blasphemously code-named “Trinity” (a distinctly Christian term). It had occurred three weeks earlier at Alamogordo, New Mexico, on July 16, 1945. The results were impressive, but the blast had just killed off a few hapless coyotes, rabbits, snakes and some other desert varmints. The Trinity test also unexpectedly produced huge amounts of a new mineral that was later called “Trinitite,” a molten lava rock that had been created from the intense heat (twice the temperature of the sun) of the above ground bomb blast. But the first full effects of an atomic bomb on a human population were not demonstrated until Aug. 6, with the obliteration of Hiroshima. But there was a second bomb, a different design from the first, that was ready for use. So, at 3 a.m. on the morning of Aug. 9, 1945, a B-29 Superfortress (that had been “christened” Bock’s Car) took off from Tinian Island in the South Pacific, with the prayers and blessings of its Lutheran and Catholic chaplains. Barely making it off the runway before the plane went into the drink (because of the 10,000 bomb in its hold), it headed north for Kokura, the primary target. Bock’s Car’s plutonium bomb was code-named “Fat Man,” after Winston Churchill. “Little Boy,” first called “Thin Man” (after President Franklin Roosevelt) was the bomb that had incinerated Hiroshima three days earlier. Yet, the reality of what had happened at Hiroshima was still sinking in among the members of Japan’s Supreme War Council in Tokyo, complicating their ability to understand the need for an immediate surrender. But it was already too late because by the time the War Council was meeting, Bock’s Car flying under radio silence was already approaching the southern islands of Japan, hoping to beat the typhoons and clouds that would have caused the mission to be delayed for another week. The Bock’s Car crew had instructions to drop the bomb only with visual sighting. But Kokura was clouded over. So after making three failed bomb runs over the clouded-over city all the while running dangerously low on fuel, the plane headed for its secondary target, Nagasaki. Nagasaki is famous in the history of Japanese Christianity because the city had the largest concentration of Christians in all of Japan. The Urakami Cathedral was the megachurch of its time, with 12,000 baptized members. Nagasaki was the community where the legendary Jesuit missionary Francis Xavier established a mission church in 1549. The Catholic community at Nagasaki grew and eventually prospered over the next several generations. However it eventually became clear to the Japanese rulers that the Portuguese and Spanish commercial interests were exploiting Japan; and soon all Europeans and their foreign religion were expelled from the country. From 1600 until 1850, being a Christian was a capital crime in Japan. In the early 1600s, those Japanese Christians who refused to recant of their new faith were subject to unspeakable tortures, including crucifixion. After the reign of terror was over, it appeared to all observers that Japanese Christianity was extinct. However, by the mid-Nineteenth Century, after the gunboat diplomacy of Commodore Matthew Perry forced open an offshore island for American trade purposes, it was discovered that there were thousands of baptized Christians in Nagasaki, living their faith in a catacomb existence, completely unknown to the government. With this humiliating revelation, the Japanese government started another purge; but because of international pressure, the persecutions were eventually stopped, and Nagasaki Christianity came up from the underground. By 1917, with no help from the government, the re-vitalized Christian community had built the massive St. Mary’s Cathedral in the Urakami River district of Nagasaki. So it was the height of irony that the massive Cathedral one of only two Nagasaki landmarks that could be positively identified from 31,000 feet up became Ground Zero for the atomic bomb. The Bock’s Car bombardier identified the landmarks through a break in the clouds and ordered the drop. At 11:02 a.m., during Thursday morning mass, hundreds of Nagasaki Christians were boiled, evaporated, carbonized or otherwise disappeared in a scorching, radioactive fireball that exploded 500 meters above the cathedral. The black rain that soon came down from the mushroom cloud surely contained the comingled remains of many Nagasaki Shintoists, Buddhists and Christians. The theological implications of Nagasaki’s Black Rain surely should boggle the minds of theologians of all denominations. Most Nagasaki Christians did not survive the blast. Six thousand of them died instantly, including all who were at confession. Of the 12,000 church members, 8,500 of them eventually died as a result of the bomb. Many of the others were seriously sickened. Three orders of nuns and a Christian girl’s school disappeared into black smoke or became chunks of charcoal. Tens of thousands of other innocent non-combatants also died instantly, and many more were mortally or incurably wounded. Some of the victim’s progeny are still suffering from the trans-generational malignancies and immune deficiencies caused by the deadly plutonium and other radioactive isotopes produced by the bomb. And here is another ironic point of this tragic chapter of history: What the Japanese Imperial government could not do in 250 years of persecution (destroy Japanese Christianity) American Christians did in nine seconds. Even after a slow revival of Christianity over the decades since World War II, membership in Japanese churches still represents a small fraction of 1 percent of the general population, and the average attendance at Christian worship services has been reported to be only 30. Surely the decimation of Nagasaki at the end of the war crippled what once was a vibrant church. Father George Zabelka was the Catholic chaplain for the 509th Composite Group (the 1,500-man United States Army Air Force group whose only mission was to successfully deliver the atomic bombs to their targets). Zabelka was one of the few Christian leaders who eventually came to recognize the contradictions between what his modern church had taught him about war and what the early pacifist church had taught about homicidal violence. Several decades after being discharged from the military chaplaincy, Zabelka finally concluded that both he and his church had made serious ethical and theological errors in religiously legitimating the organized mass slaughter that is modern war. He had come to understand that, as he articulated it, the enemies of his nation were not, according to New Testament ethics, the enemies of God, but were rather fellow children of God who were loved by God and who therefore were not to be killed by God’s followers. Father Zabelka’s conversion away from the standardized violence-tolerant Christianity turned his Detroit, Michigan ministry around 180 degrees. His absolute commitment to the truth of gospel nonviolence just like Martin Luther King Jr. inspired him to devote the remaining decades of his life to speaking out against violence in all its forms, including the violence of militarism, racism and economic exploitation. Zabelka even travelled to Nagasaki on the 50th anniversary of the bombing, tearfully repenting and asking for forgiveness for the part he had played in the crime. Likewise, the Lutheran chaplain for the 509th, Pastor William Downey (formerly of Hope Evangelical Lutheran Church in Minneapolis, Minnesota), in his counseling of soldiers who had become troubled by their participation in making murder for the state, later denounced all killing, whether by a single bullet or by weapons of mass destruction. In Daniel Hallock’s book, Hell, Healing and Resistance, the author talks about a 1997 Buddhist retreat led by the Buddhist monk Thich Nhat Hanh. That retreat attempted to deal with the hellish post-war existence of combat-traumatized Vietnam War veterans. The truth of Hallock’s comment should be a sobering wake-up call to Christian leaders who seem to regard as equally important both the recruitment of new members and the retention of old ones. The fact that the U.S. is a highly militarized nation makes the truths of gospel nonviolence difficult to teach and preach. I am a retired physician who has dealt with hundreds of psychologically traumatized patients (especially combat-traumatized war veterans), and I know that violence, in all its forms, can irretrievably damage the mind, body, brain and spirit; but the fact that the combat-traumatized type is totally preventable as well as, for the most serious cases, virtually impossible to cure makes prevention work so important. And that is where Christian churches should and could be instrumental. An ounce of prevention is indeed worth a pound of cure. These traumas are deadly and sometimes even contagious. I have seen violence, neglect, abuse and the resultant traumatic illnesses spread through families even involving the third and fourth generations after the initial victimization or perpetration. It is important to know the hidden history of Nagasaki Christianity and the virtual annihilation of it by American Christians. The Bock’s Car bomber crew members, like most grunts in any war, were at the bottom of a long complex anonymous chain of command. They only “pulled the trigger” of the weapon which was manufactured by some other entity and put in their hands by still others. As in all wars, the WWII soldier trigger-pullers usually didn’t know exactly who they were trying to kill or even why. The early church leaders, who knew the teachings and actions of Jesus best, rejected the nationalist, racist and militarist agendas of the national security agencies of the day. They also repudiated the pre-Christian eye-for-an-eye retaliation doctrines that have, over the past 1,700 years, regained dominance and led Christians to willingly kill both Christians and non-Christians in the name of Christ. Dr. Gary G. Kohls is a retired physician who is involved in peace, nonviolence and justice issues and therefore resists fascism, corporatism, militarism, racism and all other movements that are violent and anti-democratic. On Aug. 9, 1945, three days after obliterating Hiroshima with one nuclear bomb as Japan’s high command met on surrender plans the U.S. government dropped a second bomb on Nagasaki killing 74,000 people instantly, a decision that has never been adequately explained, writes John LaForge. “The rights and wrongs of Hiroshima are debatable,” Telford Taylor, the chief prosecutor at Nuremberg, once said, “but I have never heard a plausible justification of Nagasaki” — which he labeled a war crime. In his 2011 book Atomic Cover-Up, Greg Mitchell says, “If Hiroshima suggests how cheap life had become in the atomic age, Nagasaki shows that it could be judged to have no value whatsoever.” Mitchell notes that the U.S. writer Dwight MacDonald cited in 1945 America’s “decline to barbarism” for dropping “half-understood poisons” on a civilian population. If shame is the natural response to Hiroshima, how is one to respond to Nagasaki, especially in view of all the declassified government papers on the subject? According to Dr. Joseph Gerson’s With Hiroshima Eye, some 74,000 were killed instantly at Nagasaki, another 75,000 were injured and 120,000 were poisoned. If Hiroshima was unnecessary, how to justify Nagasaki? The saving of thousands of U.S. lives is held up as the official justification for the two atomic bombings. Leaving aside the ethical and legal question of slaughtering civilians to protect soldiers, what can be made of the Nagasaki bomb if Hiroshima’s incineration was not necessary? Russia did so, Aug. 8, 1945, and as Ward Wilson reports in his Five Myths about Nuclear Weapons, six hours after news of Russia’s invasion of Sakhalin Island reached Tokyo — and before Nagasaki was bombed — the Supreme Council met to discuss unconditional surrender. Nagasaki was attacked with a bomb made of plutonium, named after Pluto, god of the underworld earlier known as Hades, in what some believe to have been a ghastly trial. The most toxic substance known to science, developed for mass destruction, plutonium is so lethal it contaminates everything nearby forever, every isotope a little bit of hell fire. John LaForge is a Co-director of Nukewatch, a nuclear watchdog and environmental justice group in Wisconsin, edits its quarterly newsletter, and writes for PeaceVoice.